Ask a Character panel at Dragon Con was a panel where voice actors from cartoons and video games answer questions from the moderator and audience in the voices of their respective characters, and even sometimes characters they do not voice. 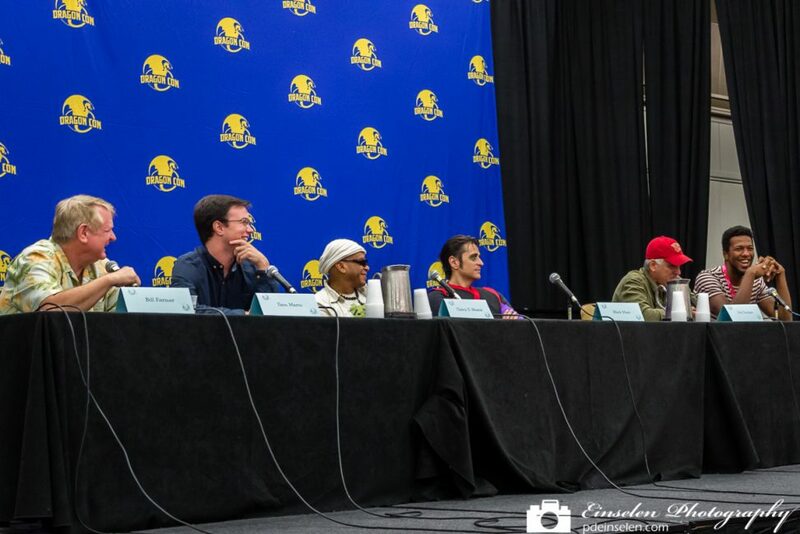 From left to right: Bill Farmer, Sam Marin, Carey S. Means, Mark Meer, Rob Paulsen. Ask a Character, or any variant of it, is a must see. I always love to hear how the character would answer certain questions. Bill Farmer is best known as the voice of Goofy since 1987. He is also the current voice of Pluto and Horace Horsecollar. Sam Marin currently voices Benson, Pops and Muscle Man on Regular Show an American animated television series created by J.G. Quintel, and produced by Cartoon Network Studios for Cartoon Network. Carey S. Means is an American voice artist and actor best known for playing Frylock in the Adult Swim show Aqua Teen Hunger Force. He also voiced Thundercleese from The Brak Show. Mark Meer is a Canadian actor, writer and improvisor, based in Edmonton, Alberta. He is internationally known for his role in the Mass Effect trilogy, in which he stars as the voice of the male version of the player character, Commander Shepard. Rob Paulsen is an American voice actor and singer who has done many voice roles in various films, television shows and video games. He is known for voicing Raphael and Donatello from the 1987 cartoon and 2012 cartoon respectively of Teenage Mutant Ninja Turtles, Yakko Warner and Dr. Otto Scratchansniff from Animaniacs, Jack Fenton from Danny Phantom, Pinky from Pinky and the Brain and the title character in The Mask. In total, Paulsen has been the voice of over 250 different animated characters and performed in over 1000 commercials. He continues to play parts in dozens of cartoons as well as characters in animated feature movies.